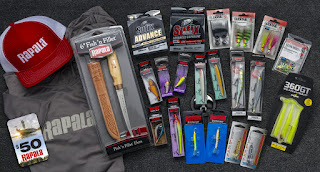 Grand Prize Winner will receive: two Rapala® Original Floater® 11, two Rapala Shad Dancers® 04, a Rippin’ Rap® 06, a Shad Rap® Deep 07, a Rapala® Husky Jerk® 12, two RipStop® 12, two Jigging Rap® W5, three VMC® Bucktail Jig two-packs, one pack VMC® Neon Moon Eye jigs, two Luhr-Jensen® Crippled herring, a Storm® 360GT Searchbait, 330 yd. spool of Sufix® 6lb. test Advance Monofilament, 150 yd. spool of Sufix® 832 Advanced Superline, a Rapala 6” Fish ’n FIllet Knife, a Rapala® Snapback Red/White Trucker Cap, a Rapala hooded, performance long sleeve t-shirt and a $50.00 Rapala® VIP Merchandise Credit Card. Retail Value $275.00.